Back in the Summer of 2012, head brewer, Jason Gonzales of Mad Pecker Brewing Co. (the team I am a apart of) made a beer called “Wheat is Now in Session,” which was a cucumber wheat session ale. I had only seen photos of cucumber beer with Cigar City’s Cucumber Saison. Never had I imagined ever tasting an actual beer with cucumber. I was amazed on how refreshing the beer actually was. The flavor of the cucumber was so dominant, it hid any trace of beer, so it was a beer that I could easily chug in mass quantities. Here we are in 2013, and after visiting one of my favorite stores, Lone Star Beverages in Carrollton, TX, I came home with a bottle of Twisted Pine Cucumber Cream Ale. I think my eyes became as big as Anime eyes when i saw that bottle on the shelf there. Crazy excited to try this beer, as a real mass produced cucumber beer. I know that when I got this beer, it was pretty fresh only being out for four months. Drinking and sharing this bottle at The Mad House, home of Mad Pecker Brewing Company. Using a Stone Brewing Company pint glass, the beer poured a cloudy bright yellow color, which made this actually look like a fruit juice rather than a beer. There was about a half inch wide bright white foamy head which remained a good while as a thin layer atop the beer, leaving nice foamy lacing down the glass. The aroma of the beer is definitely cucumber heavy, which for me is very clean and refreshing. There is a slight grain background, which shows up at the back of the nose after the smell, but this is seriously overpowered by the cucumber. The flavor was also cucumber heavy right away, as soon as it hits the lips and throughout the entire swill. This beer is very refreshing. There is again, the subtle hint of the malts, giving this a slight graininess. Just as the aroma though, even though there are hints of other ingredients showing up, the cucumber really overpowers here, making it the main character. Not that it is a bad thing, as the cucumber made this beer very inviting, and refreshing. The body was a light-medium thickness, with a light creamy mouthfeel. Good carbonation, so not much of a bite. This one was definitely as easy drinker. Overall, I will say I was impressed by the refreshing aroma and flavor, but at the same time I was looking for something a bit more balanced in this beer. It was just way too overpowering with the cucumber. I would have liked the malts, and hops to shine a bit more to mix well with the cucumber. As I said earlier, I had a beer brewed with cucumber real close to home, so I was comparing, and I was just looking for more complexity. I will love to drink this beer again though, as I did enjoy this session, so I hope they brew this one again. Metal Connection: The pairing here was quite easy. 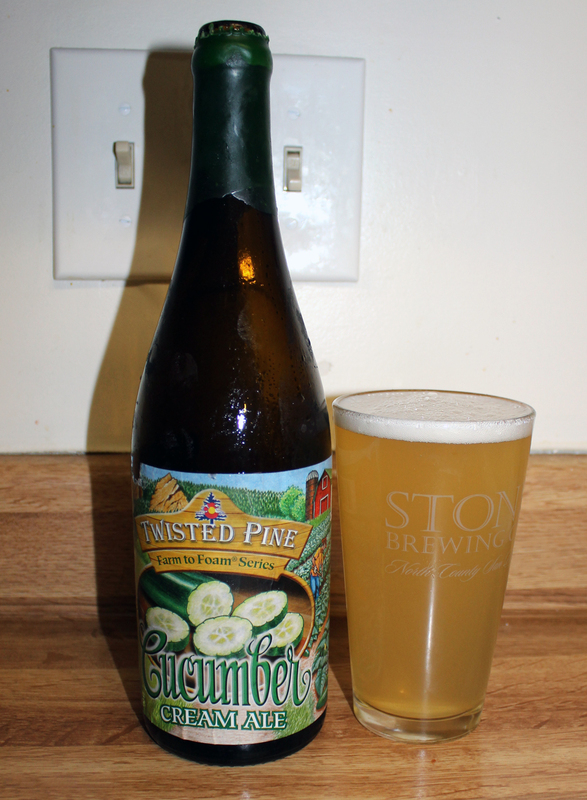 I knew right away I would not find a band or song anywhere near the word cucumber, so I immediately turned to the name of the brewery, Twisted Pine. As I have already used my obvious choice, Twisted Sister before in a review, I went with another band that I find quite enjoyable, Twisted Tower Dire from Virginia. Back in the early days of my metal career when I was doing my fanzine, I remember having a demo from these guys. I didn’t stay with them throughout their career, but I am familiar with their releases as of late. I chose the title track from their 2011 full length album, Make it Dark.